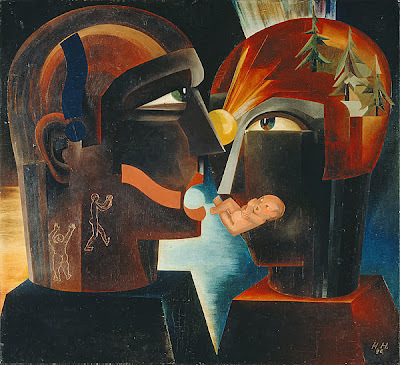 Hannah Höch (1889-1978) was born in Gotha. 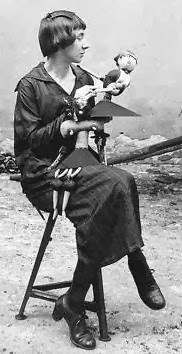 Her father was the director of an insurance company, her mother a hobby painter. 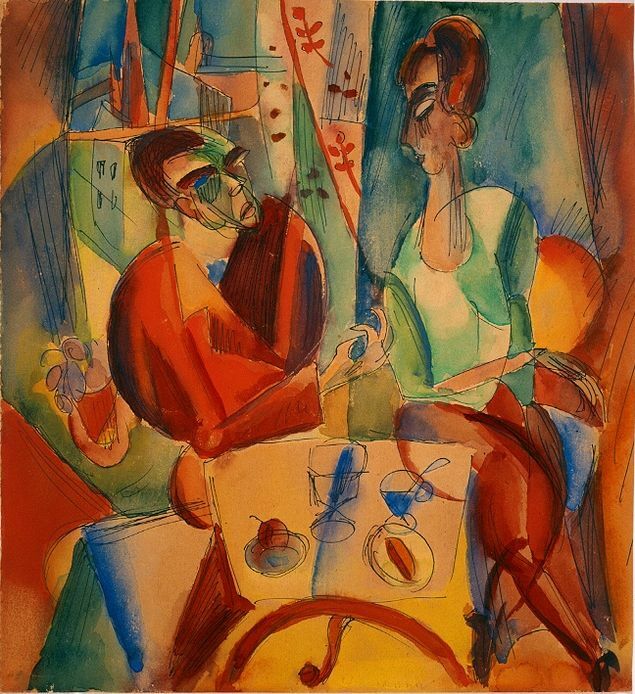 Hannah studied at the Kunstgewerbeschule (Arts and Crafts School) in Berlin between 1912 and 1915. 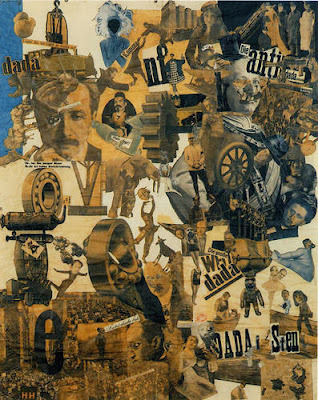 She finished her studies under Emil Orlik, concentrating on collage techniques. After her schooling, she worked in the handicrafts department for the Ullstein publishing house, designing dress and embroidery patterns for Die Dame (The Lady) and Die Praktische Berlinerin (The Practical Berlin Woman). 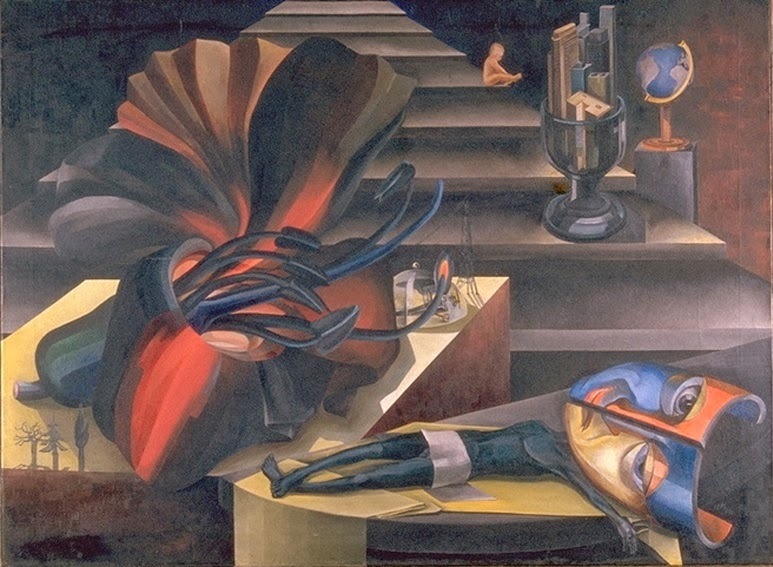 She met Dadaist Raoul Hausmann in 1915 and they became close friends. 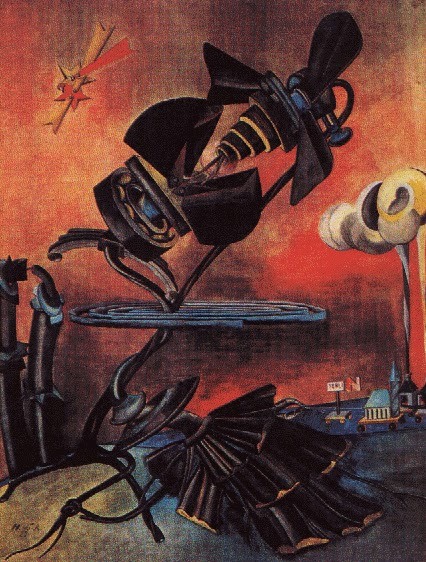 Höch was the only woman participating in the First International Dada Fair which took place at at Dr. Otto Burchard’s Berlin art gallery in July 1920. 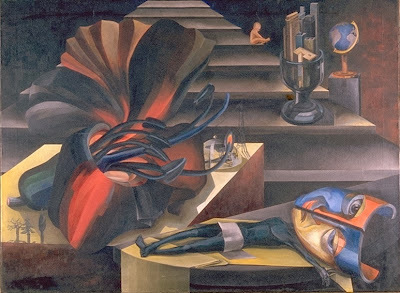 Among her fellow dadaists were Johannes Baader, George Grosz and John Heartfield. 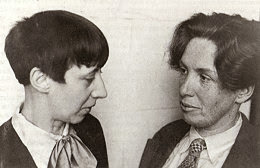 Höch's personal relationship with Hausmann grew from friendship to a temptous romance over time, but they separated in 1922, partly because Höch didn't like Hausmann's insistence on an "official" ménage à trois together with his wife (Hausmann's dream came true in the late 1920s, when he moved with his wife Hedwig and his model Vera Broido to the fashionable district of Charlottenburg). 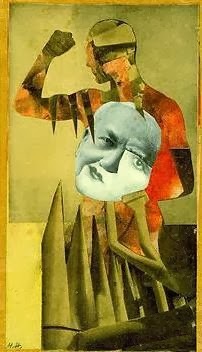 Hannah Höch - by now living with a woman, Dutch writer Til Brugmann, left a sketch of Hausmann around 1931: "After I had offered to renew friendly relations we met frequently (with Til as well). At the time he was living with Heda Mankowicz-Hausmann and Vera Broido in Kaiser-Friedrich-Straße in Charlottenburg. Til and I went there often. But I always found it very boring. He was just acting the photographer, and the lover of Vera B, showing off terribly with what he could afford to buy now - the ésprit was all gone." 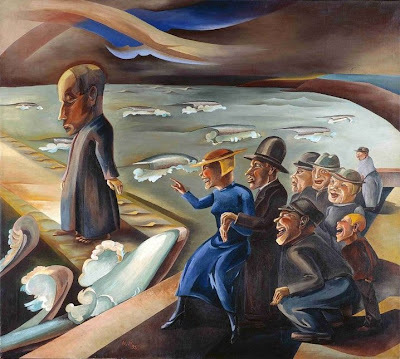 Höch observed in an undated note: "None of these men were satisfied with just an ordinary woman. In protest against the older generation they all desired this "New Woman" and her groundbreaking will to freedom. But - they more or less brutally rejected the notion that they, too, had to adopt new attitudes. This led to these truly Strindbergian dramas that typified the private lives of these men". Another brilliant and utterly ironic collage from 1919 (below) shows Friedrich Ebert (middle), first President of the Weimar Republic and his "bloodhound", defence minister Gustav Noske (right above), who was responsible for the assasination of Rosa Luxemburg and Karl Liebknecht earlier that year. Both men are depicted in bathing suits with a fig leave - a symbol of innocence - before their bellies. 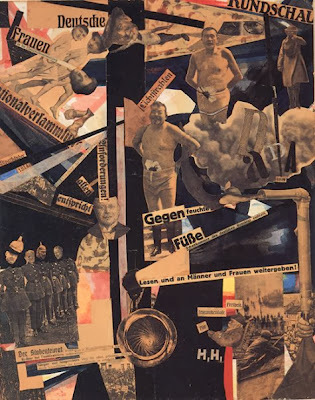 The collage also refers to the so-called "bathing suit affair": After the liberal Berliner Illustrierte had printed a photo of Ebert and Noske in bathing suits, the right-wing press (which, a couple of months earlier had celebrated the assasinations of Luxemburg and Liebknecht) started a campaign against the "obscene behaviour" of the two statesmen. An exciting work during the mid 1920s was the ambitious From the Ethnographic Museum series, 17 works that constitute an epic foray into the notion of alien cultures and female identity (see Imaginary Bride below). It was visually influenced by the newly-redone tribal art displays in Berlin's Ethnological Museum. Höch’s focus on the nature of female identity (and its depiction in the media) reached a crescendo in the early 1930s in works like Tamer (below). Most probably Tamer relates to her new life with Til Brugman (they were together from 1926 to 1936). It represents the general move toward increasing gender ambiguity in Höch’s imagery, as can also be seen in her self-portrait Russian Dancer. 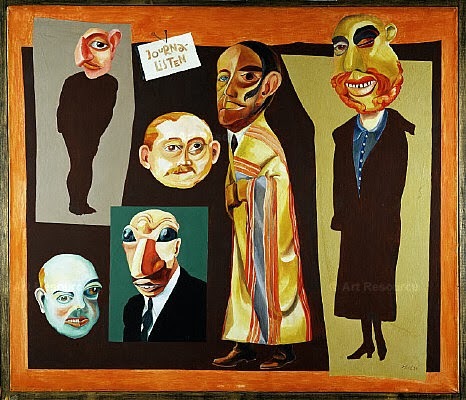 Höch made many influential friendships over the years, with Hans Arp and Kurt Schwitters among others. She met Theo van Doesburg and Piet Mondrian in 1924 in Paris, and a trip to Holland in 1926 was extended to a stay of three years. Here, in 1926, she met and grew to love Til Brugmann. The relationship, scandalous as it was for the time, sharpened her eye to the allocation of male and female roles. 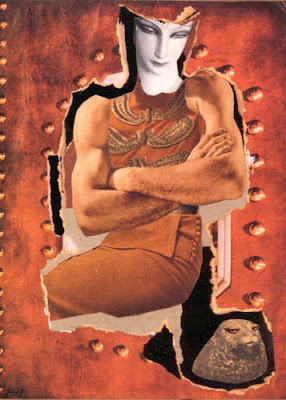 Höch and Brugmann returned to Germany in 1929, and she participated in two important exhibits: The prestigious Film and Photo exhibition, the first big photography show in Europe, included 18 of her photomontages. Some 10.000 people saw the exhibition on its first tour stop alone, Stuttgart. 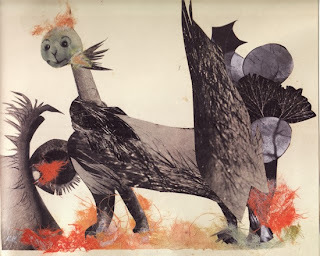 In that year, the De Bron Gallery in The Hague mounted her first one-woman show, which included her oil paintings, numerous drawings, and watercolors, though not her photomontages. 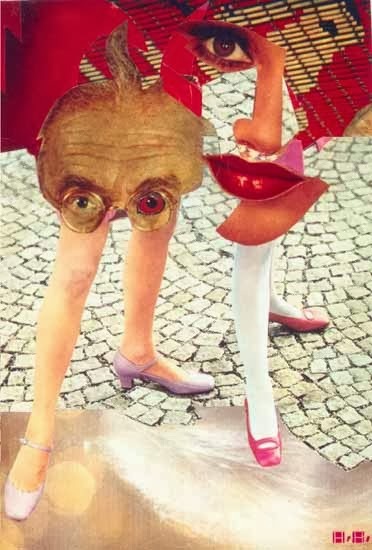 As the 1930s wore on, Höch’s world became increasingly dangerous. She expressed her feelings of loneliness and isolation in her painting The Fear (below). Höch married the much-younger businessman and pianist Kurt Matthies in 1938 and divorced him in 1944. In September, 1939, a few days after the begin of the Second World War, she moved to the relative obscurity of Heiligensee, a remote suburb of Berlin. 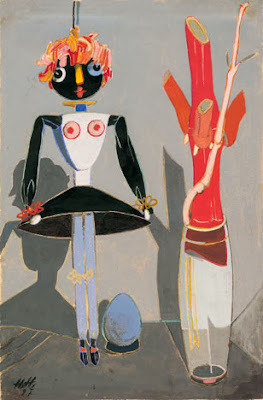 She felt lucky to have found a place where "nobody would know me by sight or be aware of my lurid past as a Dadaist". But God gave him the white. he lives out his life. it’s the wrong one — explicitly. Höch exhibited works at the large Dada exhibitions such as at the Museum of Modern Art in New York in 1948 and at the Kunsthalle Düsseldorf in 1958. Other exhibitions in London and Paris followed. An important retrospective exhibition of Höch's work was organised in 1973 in Paris and then toured to her hometown Berlin. 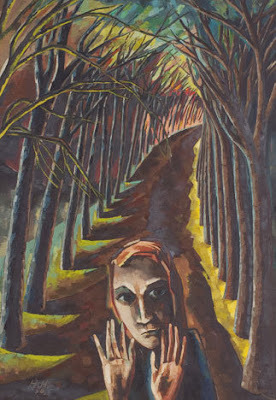 Höch died in 1978 at the age of 88 years in her house in Berlin-Heiligensee. Posted by Kraftgenie at 3:57 p.m. Anonymous October 10, 2010 at 1:27 a.m.
Where can I buy one of these pieces? Natalia October 27, 2010 at 1:23 a.m.
what are you exactly looking for? is there a way to contact you? Kimberly April 27, 2011 at 12:08 a.m.
Do you know where I can find information on Höch's Grotesque? DadaGirl October 4, 2011 at 1:37 a.m. If you like Grotesque, I suggest you look at the work of a French artist now living in Mexico--Béa Aaronson. Her work shows Höch inspiration, and more. Beautiful works, and you can afford them. Anonymous November 2, 2011 at 3:48 a.m.
Where did you read about Hausmann pressuring Höch to do a ménage à trois with him and his wife? I would like to include this information in my paper but I would like to cite the original source. Clark Gunion March 29, 2013 at 6:06 p.m.
Nice job with Hoch and Hausmann's relationship.